“All Systems Operational!” is the kind of thing everyone loves to see and hear. Unfortunately failure is always lurking around the corner. During our outages in the past, we lacked a public facing way to inform our users and customers about potential issues on the platform, both for open source and private projects. In short, we lacked a status page. We’re sorry for holding off on shipping one for so long, but the good news is, we finally have one in place. 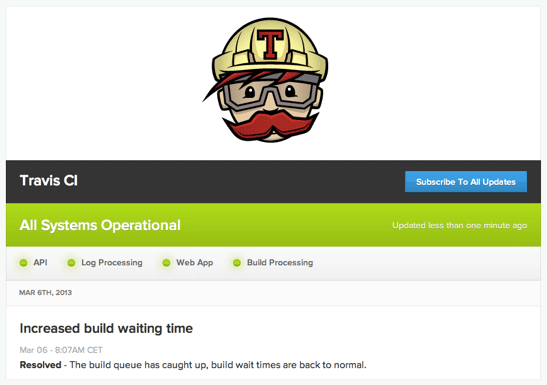 If you hop over to http://traviscistatus.com you’ll be greeted by our friendly mascot and the current state of all relevant parts of Travis CI, together with the latest incidents and their resolutions. The status updates are also connected to our Twitter account, so any incidents will be posted there as well. We’ll publish notifications for both platforms there to avoid the confusion of having two status pages for each separately. The status page also supports updates notifications via email, so you can sign up to be notified via email when an issue comes up. Note that you’ll get notifications for both platforms, which may or may not be relevant to you depending on which ones you’re using. We’re using a hosted service for this service, courtesy of the fine folks at http://statuspage.io. They just yesterday shipped an initial version of their API, so we already started implementing support for hubot so we can update the site’s status from the comfort of our Campfire room.